you're one of the lucky ones if you get caught in a snow storm while in georgia - at least in my opinion. however, hindsight is 20/20 and atlanta and georgia might look at impending storms a little differently in the future; however, that's a topic for another time. i had had a photo shoot set for weeks with nineteen-year-old baseball sensation clint frazier who was drafted by the cleveland indians last year. during his senior year at loganville high school, frazier's seventeen home runs and .485 batting average ignited scouts, and he was expected to go in the first round to boston. in the end and in the fifth slot of the first round, the cleveland indians scooped him up. my deadline was the beginning of february for georgia connector magazine coverage. his deadline was his departure for spring training with the arizona tribe. who knew snow would cause such a fuss? however, on the eve of 2014's biggest snow storm, we decided to go ahead with what might have been my only shot. literally. it was a speedy meet-and-greet, and with a substantial handshake, it became clear that this boy-wonder could hold a bat. 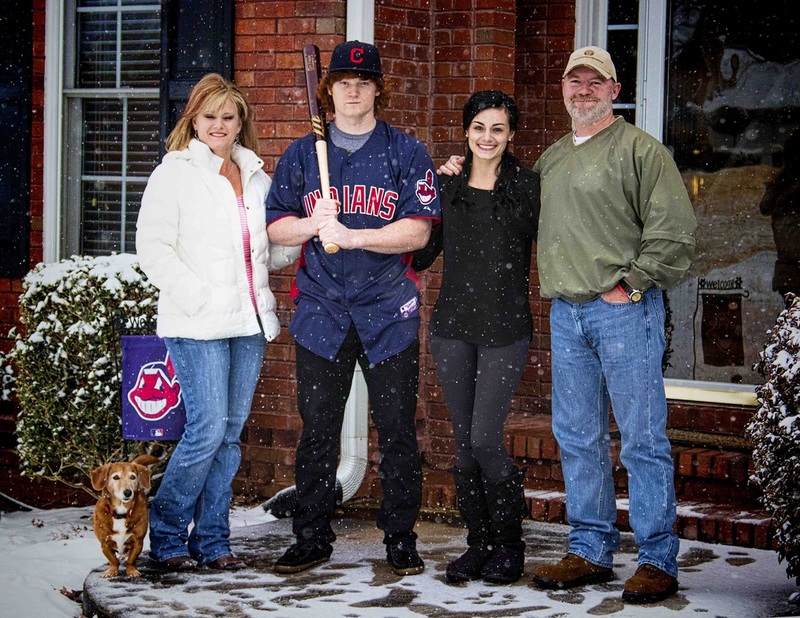 we bobbled wardrobe choices, and finally, it was a fielder's choice of an indians jersey. the quality start just outside the front door included accelerating flurries, decelerating my ability for a clean hit. however, he and his family were troopers and although our endeavor was no perfect game, we did what we could and made plans for the elusive game seven. i'm so privileged to meet people that i would normally never encounter. as an editor and photographer, i'm introduced into the lives of ordinary people who are so fortunate to be living their dreams, or really, just a good life. I spoke with clint's father, mark, before our face-to-face meeting on this snowy day, and through our conversations, i felt like i knew the force behind the kid. there was a push, a power in his voice, a down-home southern dad who, more than likely, spent every weeknight at practice, every weekend at games, every bit of spare change on batting cages and his nightly prayers asking for the best for his his two children, clint and his sister, taylor. the frazier family foundation. so as a gatorade player of the year, a first-round draft pick and an extremely rich young man, i wish you the best - in and out of snow. if you every get weary from what may well be a marathon disquised as a sprint, remember that your strength lies in a little town in georgia, in a home on ivy ridge. clint's not the first talent i've interviewed in loganville and i suspect, he won't be the last. it's a breeding ground of faithful parents, supportive teachers, and a community hell-bent on catering to and encouraging those dreamers who thrive on talent and hard work. as he makes his way to arizona for spring training around the end of february, he'll forget all about our snow day. but i suspect, i'll remember him as opening day commences and i take a closer look at the indians roster and schedule, hoping to see my new friend in the outfield.